Positioned between the two hills of the Alfama and Chiado districts, The Baixa district is the heart of Lisbon and was completely rebuilt after the devastating 1755 earthquake. There are magnificent plazas and many of Lisbon’s most important tourist attractions, connected by wide, straight avenues lined with grand 18th-century architecture. We’ve designed 5 km and 7.3 km options. Also see our guide to the area, below. Shorter Run: Rossi Sq. to Eduardo VII Park . 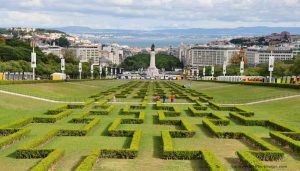 The best place to run here is along Avenida da Liberdade, up to Eduardo VII Park and its central walk. From Rossi Square, it’s 5.1 km (3.2 miles) out and back. The Avenida has a wide, shaded pedestrian median. 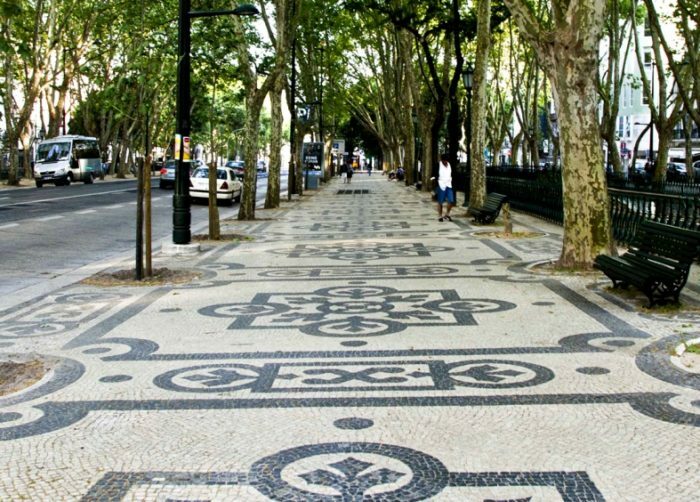 It’s 1.8 km to the grand Marquess of Pombal Statue, where it’s best to use the underground passageway to connect to Eduardo VII Park. A wide, grand and somewhat imposing walkway leads uphill through the park for ~1 km to Jardim Amália Rodrigues and its fountain. You can run on the grass lawn. Longer Run: Start at the Waterfront, adds 2k. Start at Praça do Comércio. Run through the magnificent Arco (Arch) da Rua Augusta, along Rua Augusta or Rua da Prata, to Rossio Square, and then follow the route above. There are lots of potential variations here: choose a different street to run through Baixa. Also, the metro runs along Avenida da Liberdade, allowing for good distance/hop-on/off options. Add-Ons: Alfama district, just east, which has narrow, fun streets for running, to hilltops with great views. Chiado district, just west, are all part of the “Bairro Alto”. Or, from Eduardo VII Park, continue along the “Green Corridor” a 2 mile bike path, to Monsanto Park.